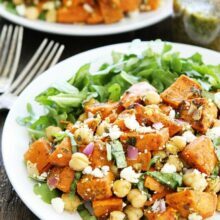 Sweet Potato Chickpea Salad with Pesto-this simple salad is made with roasted sweet potatoes, chickpeas, red onion, basil, feta cheese, and pesto. It is full of flavor and great served as a main dish or side dish. Are you in a summer salad rut? I eat salad just about every day during the hot summer months, but sometimes I start feeling like I’m in the movie Groundhog Day because I tend to make the same salad over and over. I don’t know why because I like lots of different salad recipes, I guess I just get in the habit of making the same old salad. Well, last week I was in need of a new salad so I made this Sweet Potato Chickpea Salad with Pesto. It brought me out of my salad rut after one bite. I instantly fell in love with this salad. Our boys love pesto so I try to keep my easy Spinach Basil Pesto in the freezer at all times. It is easy to pull out to add to pasta, gnocchi, pizza, sandwiches, or salads. Luckily, I had some pesto in the freezer so I pulled out a container and used it in my salad. It was the perfect flavor boost to the roasted sweet potatoes and chickpeas. I also added in some diced red onion, fresh basil, and feta cheese. I like to serve this salad on a bed of arugula or mixed greens. It is good on it’s own, but I like to add more greens into our diets any way I can. Bring on the greens! 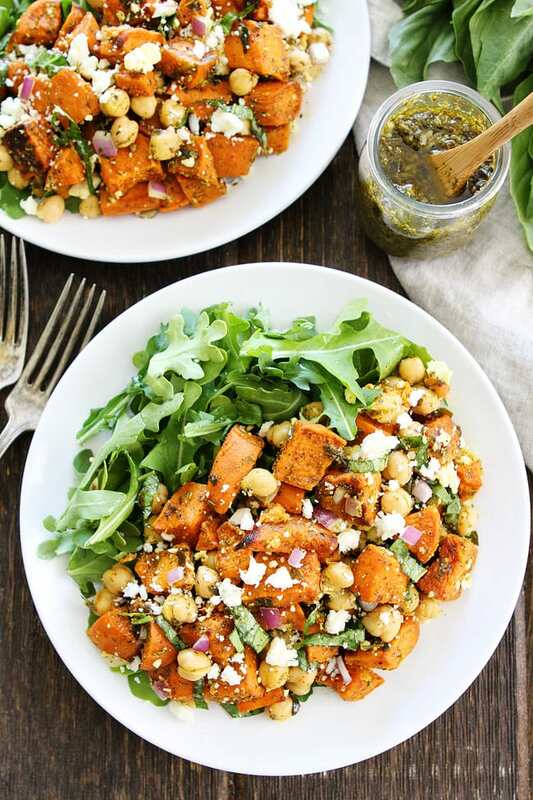 Get out of your salad rut and make this Sweet Potato and Chickpea Salad with Pesto. The only problem, you will probably want to make this salad every day. I know I could eat it every day, I have been. I will change to a different salad soon. I promise. 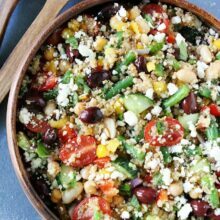 This simple salad is full of flavor and great served as a main dish or side dish. Preheat oven to 400 degrees F. Cut sweet potatoes into 1/2-inch pieces. Place on a large baking sheet and drizzle with olive oil. Toss until well coated. Season with salt and black pepper, to taste. Roast sweet potatoes for 40 minutes, stirring occasionally. Remove from oven. 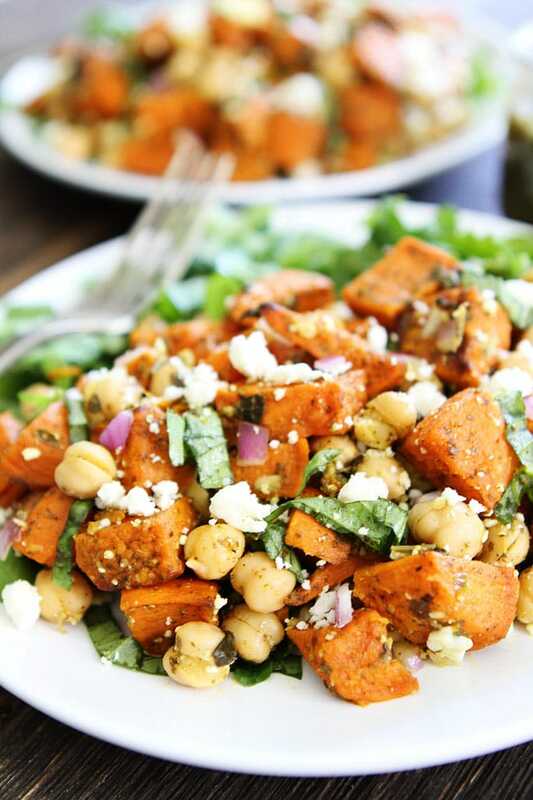 In a large bowl, combine roasted sweet potatoes, chickpeas, pesto, red onion, basil, and feta cheese. Gently stir until well combined. Try not to break up the sweet potatoes. Season with salt and black pepper, to taste. Place arugula or salad greens on a plate. 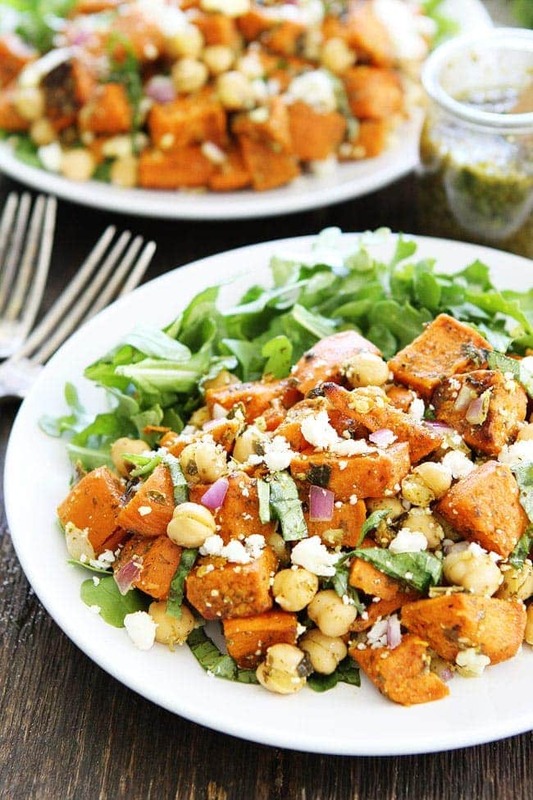 Top with sweet potato, chickpea, and pesto salad. Serve immediately. Note-this salad is good at room temperature or cold. You don't have to serve it on a bed of greens, but I like to. 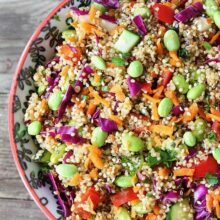 I loooove chickpeas in a salad, and I’m trying to find new ways to eat sweet potato… So I’m going to have to pin this recipe! And yay for pesto, it goes with almost anything. Have a great day! This looks so good. I love chickpeas an insane amount and them with pesto sounds like a perfect combination. I can’t wait to try this pretty salad! Protein packed! hey girl this looks pretty good! Very creative! I love different kinds of salads to! This salad looks incredible! I need it in my life! I never thought about including sweet potatoes in a salad before. It sound like a very nutritious salad. 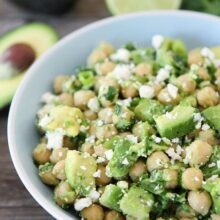 I am just getting into sweet potatoes now, I know so late LOL But I love chickpeas and pesto so I have to try this salad asap! Love the look of it. These flavors are so great!! this is really clever, I’ve been looking for more sweet potato uses, thanks for this? 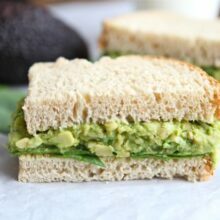 This is my new favorite meatless Monday meal! Thank you! Love chickpeas and sweet potats. What a lovely recipe! Just made this last night, and it was delicious! Love the marriage of pesto, chickpeas, and sweet potatoes, and the red onion really added good flavor! Was a good accompaniment to pork.